A couple of weeks ago The Guardian leaked sensitive information regarding common NSA surveillance practices. These leaks left the world reassessing the boundaries of privacy and ‘safety’. With his disclosures, Edward Snowden became the man of the hour, reviving the excitement and curiosity for the hacking culture. As the world became stagnant, taking in every drop of information that was available; wondering if every dash of data leaked would flip the scale of privacy versus security. Would this become a revamped WikiLeaks 2.0? Will this be the latest version of uncovered ‘truths’ which the world has purposely chosen to remain aloof about? In the name of national security, peace of mind and technological advancements, everyone has blindly agreed to the ‘terms and conditions’ attached to products, apps, social media websites, software and companies. But at what cost is this information made available? Who decides how this information is used? Who is entitled to access this information? In brief, what are the moral boundaries of hacking? Before dissecting the decency of hacking, it is imperative to define it. According to whatishacking.org, “Hacking is the practice of modifying the features of a system, in order to accomplish a goal outside of the creator’s original purpose”. Why would anyone have the right to modify the default features of a system? More importantly who is entitled to make such changes? How are such privileges earned? In order to answer such questions, it is essential to determine what motivates certain individuals to ‘hack’ and release information not designed for public consumption. Some individuals and groups do it to truly help improve and solidify a system. These ‘good’ hackers test current systems in order to encounter –and fix- flaws. In fact, Edward Snowden was employed as an “Ethical Hacker”. Their job comes as a direct response to attacks from inconspicuous characters. These inconspicuous characters are ‘bad’ hackers that break into systems out of spite or simply because they can. Causing harm in order to boast their egos or benefit another party (whether hacking for the government or for corporations). There is a third group of hackers who do it as a form of protest, usually against a particular economic, social or religious policy (e.g. WikiLeaks). Thus, it can be said that certain hackers, much like other individuals, use their unique skill-set to attain fame, create disruptions, correct inequalities and promote their personal beliefs. Nonetheless, are these factors enough to justify the abuses that are committed in the name of strategically and eloquently used nouns ‘justice’, ‘freedom’, ‘truth’ and ‘profitability’? Are these actions ever justifiable? Given this is such a controversial topic, the definitions of good and bad may vary significantly. Since history is only written by those who are victorious and it does not take into account the narrative of the defeated. North Korea and South Korea, war by means of hacking. Three months ago a ‘malware’ known as “DarkSeuol” shutdown computers all over South Korea. More importantly the malware hit the financial heart of South Korea impeding menial yet critical services, such as withdrawing money from an ATM. Many sources report the origin of the malware to be in China. Yet as reported in the New York Times, North Korean hackers honed their skills in China and operate from there. Last week, during the 63rd anniversary of the Korean War, several websites (including government and media) were shutdown in both nations. As a preemptive measure against possible cyber-attacks. 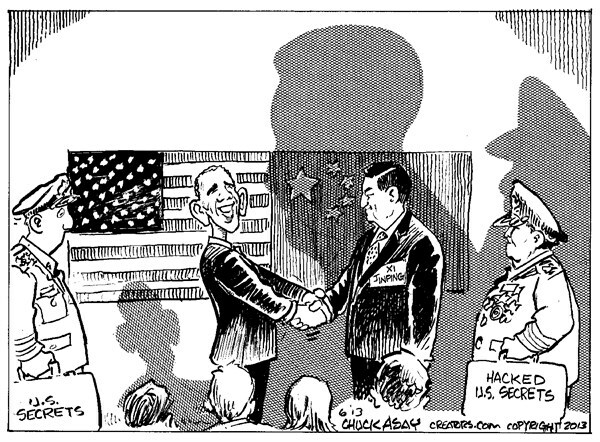 Considering the thorny and gossamer relationship between these nations, is hacking justified in this context? At this rate, future wars will not come in the conventional sense (land and resources). But rather it will come in the form of a battle for information and exposing vulnerabilities in a country or military’s network. Several terrorist acts that have been stopped thanks, to government surveillance program. For example the alleged Canada Day plot, was curtailed because the suspects were under government vigilance. It can be deduced that several other plots were stopped as a result of the invasive measures taken by government agencies. How many other terrorist actions could have been prevented if more surveillance was involved? Should freedom and privacy be the price of security? As with anything in life, nothing here is black and white. Everything is a different shade of gray. Thus, every situation must be analyzed and treated as a unique instance. For instance, if consumers willfully agree to give up information, why is it a surprise when it is used against them? A healthy and conscious debate has to be encouraged in order to assess the price of freedom and technological convenience. It is time end users demand better management and protection of the information that is collected. Realistically no government will ever be able to handle such sensitive information in a transparent and just way. As consumers, it is urgent and imperative to pressure companies to exert more control on the information that is collected. If not, then they should educate themselves about how their information is going to be utilized. If they are not happy with it, then they should withdraw from giving up their information. In the end, I have no answer in terms of the morality of hacking. I pass this question on to you. How do you define the trade-off between privacy and security? As I surfed the web, flipped channels and sifted through topics, I hoped to find the world’s latest fixation to be mildly tolerable. What is everyone discussing these days? Better yet, what are they thinking but not discussing? Salvation appeared in the form of comedy (what else?). More accurately, the messenger of salvation was one called Jon Stewart and his satirically hilarious faux award ceremony. Two clear winners emerged from that episode: Daniel Day Lewis (what hasn’t he won?) and China. No one can argue with Daniel Day Lewis’ talent to get to the heart of a character, but China? Well, it just so happens that China is not only winning the war in Iraq but it’s on its way to becoming a local hero. Let’s define winning within this context. From my perspective (and that of several journalists from Bloomberg to the NY Times), winning is defined in terms of economic benefit. Winning should not be confused with profitability because by that standard Western companies –Exxon and Shell – are still the most profitable companies in Iraq. Based on economic benefit, China is whistling a victorious tune all the way to the bank. In fact, China is highhandedly acquiring half of the entire oil production in Iraq. However, China’s role is not just confined to purchasing oil. The Chinese state owned corporation CNPC has acquired development rights for the next 20 years with an investment upwards of $2 billion. Besides pouring cash into a cash strapped nation (and cash strapped oil industry), China is willing to play by the current government’s strict rules. Another game changer to the oil development industry brought about by China is the CNPC’s willingness to accept lower profits. Slowly, intricately and manipulatively China is suffocating Western companies by undercutting them. Essentially, China is changing the way business is being conducted in Iraq. Whether or not these new business practices are actually benefittingl the Iraqi people is yet to be determined. This is especially troubling when one considers that Iraq is a volatile mix of economic, social and religious issues that could implode if not handled assiduously. From a macro perspective, the US and India are by far Iraq’s strongest trading partners. Together they account for a combined 45% of the country’s entire export market. China comes in at distant third place with only 13% of the total exports. China may be producing and consuming the Iraqi oil but the US still remains a key partner in the country (and the entire region). The question is for how long? It is indisputable that balance of power is shifting. China is already on a course to overtake the US as the largest trading partner in the world. With China’s insatiable appetite for oil and growing demand for other commodities, it is likely that China will use its vast industrial power to tilt the region (and the world) to its personal benefit. 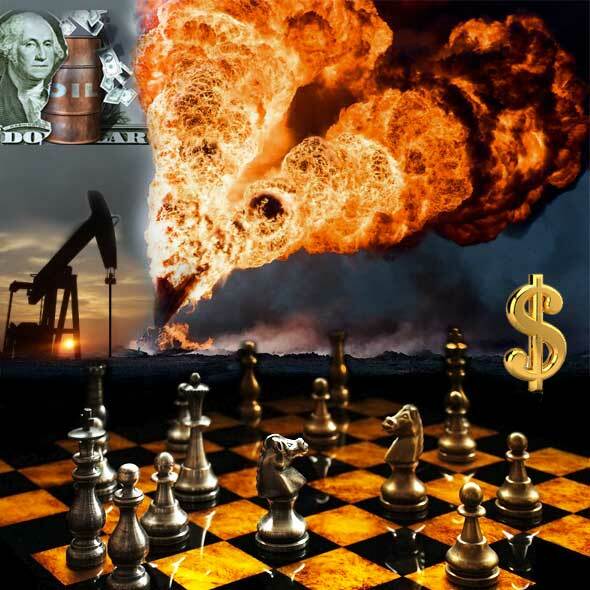 What will be the USA’s next move in this game of diplomatic and economic chess? More importantly, who are the pawns? Does It Matter If China Wins? From a romantic and idealistic perspective it is acceptable that someone else emerges as the winner. Having said that, Iraq is now a free market and the country should be judicious about contract allocation. Hopefully this nascent democracy will set its own rules and focus on developing the country and responding to needs of the people as opposed to those of corporations. It’s a delicate situation on a tightrope, and I’m sure that the reality with which the Iraqi people live everyday is much more complex than the Utopian imaginings of this author. Still, America (or at least some parts of America) feel cheated with this result, especially considering the FUBARs Iraq and Afghanistan turned out to be. This is a product of typical colonialism mentality where individuals and nations are treated as bounty prizes that can be split among would be conquerors and liberators. In short, it seems like a modern day retelling of the Treaty of Tordesillas. In actuality, this end result isn’t all bad for the US. In fact, a Chinese victory benefits us all. I can think of at least three crucial benefits from China’s growing presence in Iraq. The largest benefit the US receives from China’s hold in Iraq comes at the expense of Iraq’s neighbors. By allowing China to become the key player in the region, long time US frenemies, such as Russia and Iran, are immediately weakened. The US has effectively stirred the power struggle between China and Russia. With the victory of China in Iraq, Russia is starting to lose relevance in the region. A second benefit from pawning Iraq to the Chinese is that China is allowed to satisfy its need for oil without denting global prices. Because China has the upper hand in the exploration and development of oil, it has literally picked up the slack created by the Iranian oil embargo (yes, there is an oil embargo on Iran since 2012). China, through the CNPC, has done a hell of job expanding the oil production in Iraq. Finally by allowing China to bear some of the costs of the war (and thus the oil production and infrastructure) the US has “saved face” with the American people. Officially it’s the CNPC enduring lower profit and larger investment requirements. The sore losers here are Exxon, Shell and BP, who are now forced to compete under new conditions that they cannot control. That’s certainly not a bad thing. So, who really won in the end? Unemployment (Underemployment): How Is It Shaping The Future? You don’t need to wait for the next jobs report in the USA or Europe, to realize there’s something inherently wrong with the job market. With unemployment soaring above 20% in some countries, it’s very hard not to ponder about what’s going on. However, the numbers ( high or low) don’t always reveal the whole the story. Contrary to what the US and German governments would have you believe, things aren’t getting much better –or at least not fast enough. Take Germany’s example, a juggernaut economy proud to state that it has the lowest general unemployment rate (under 6%) within the Euro zone. Sounds good doesn’t it? Unfortunately, after closer inspection, and for the first time in decades, it appears that the harsh reality is that the future is not presently being considered. No matter where you look unemployment seems to be a youth issue. The recession hit young people, especially graduates, the hardest. Millions of youngsters are out of the job market or, equally worse, underemployed. In fact, many are suffocated with student loans they are unable to repay. According to The Economist, about 290 million people between the ages of 15-24, are unemployed or employed in sectors not related to their concentration or capacities. After several years of expansive growth the financial bubble (and several other bubbles) burst. As a result, growth stalled and a prosperous economic cycle was brought to its knees. The ripple effect of the financial crisis affected every section of the globe. Globalization connects everyone on the planet; thus, everyone felt the punch. Six years into the recession, governments are facing sluggish growth and through harsh austerity policies. Meanwhile on the other side of the spectrum, things couldn’t be more different. Companies are still hoarding massive amounts of cash and becoming less risk oriented. This is never more evident than when companies choose experience over education. Hiring a person with little to no experience implies a greater risk, one that requires time and money. However, the crawling economy is not the only culprit for the high levels of youth unemployment. There is a dissonance between the career paths chosen by Gen Y and the reality of the workforce. How many English, Liberal Arts and Sociology majors does a country need? I have great respect for everyone who pursues their passion, but I do wonder at times if one should consider usefulness over passion. Unfortunately everyone is bound to the reality of having to earn a living, which is not always aligned with one’s personal interests. Each generation has unique situations that profoundly impact their lives, career decisions etc. ; aspects that will be carried on for years to come. With such a high number of the future unemployed/underemployed, what will the next 30 years look like? 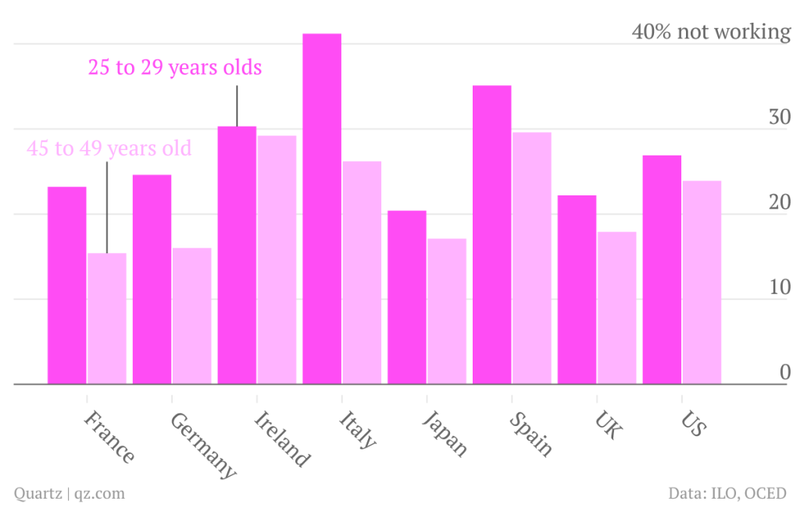 What will retirement mean for Gen Y? One thing can be assumed: the way we enjoy and envision certain aspects of life like college, retirement or work, will vary significantly from today’s definition and expectations. For instance, in one of their skits The Daily Show pundits make light of the current value of college and try to prevent people from entering careers with no future. College is no longer seen as the gateway to the acquisition of social mobility. Not because education isn’t necessary, but because the current education system is immensely flawed and is not in tune with the economic and social zeitgeist. Education became a profitable business that long ago forgot its mandate of usefulness and relevance. Unless things change for the better I doubt future generations will continue to ‘invest’ in higher education. Retirement is another example. Can Gen Y afford to retire? In direct contradiction to practices of the past, Gen Y is already unfashionably late to the employment party. Crushed by debt and low asset ownership it doesn’t seem like life will begin in earnest for Gen Y anytime soon. Current trends suggest that consumer spending will not be the driver of growth and innovation for the future. Companies and government be aware! Forcing consumer spending is not a sustainable long term solution. It’s not just the future that is in jeopardy because the present continues to crumble before our very eyes. High unemployment contributes to poverty and poverty fuels radicalization and extremism, especially in terms of immigration-the fallacy that foreigners take jobs from locals and devalue wages. Such views have even reignited the debate of racial supremacy. It is no coincidence that a neo-Nazi controls 10% of the parliament in Greece and anarchy reigns supreme. Radical groups with their own agendas have always taken advantage of the hopelessness of the masses. Today these social parasites have uncovered a new niche for the aggrandizement of their flawed ideals by preying on disenfranchised youths that are looking for someone to blame and any cause to give their lives meaning. I predict that life will be significantly different for the next 30 years. The rioting and demonstrations will continue unabated if things don’t change. As such, companies should lose their fears of hiring youngsters and rather use this as an opportunity to cultivate and mold talent in accordance with corporate needs. On the other side, Gen Y should drive innovation and discover new ways of doing things. It cannot (and should not) be content with the status quo. It’s time Gen Y stops living under the shadows of Gen X and Baby Boomers and starts writing its own rules towards progress. George Chapman The Conspiracy and Tragedy of Charles, Duke of Byron, 1608. Why Should You Care About What’s Going On In Venezuela? Among the several news stories roaming the world this weekend was the presidential election in Venezuela. The election was energetic, colorful and full of the idiosyncrasies common in Latin American politics. However, for the first time in 14 years, the results were too close to call. For starters, the country had been under the ‘democratic’ rule of Hugo Chavez since 1998. Chavez died from cancer on March 5th following a painful and exhausting battle with the disease. After a circus like funeral, which included a parade with Chavez’s body through the capital of Venezuela and a 10 day wake (Chavez’s body has still not been buried), elections were called for April 14th. Chavez’s confidant, the former foreign affair minister and current vice-president Nicolas Maduro, had been elevated to the status of candidate. Now, Maduro is a man that inspires doubt internally and externally, specifically in terms of his capacity to unite Venezuela while following in the footsteps of a charismatic man like Chavez. Like it or not, Chavez forever altered the landscape of the Latin American region. The opposition, a 40 year old lawyer by the name of Henrique Capriles, is a member of the private sector and an avid politician. He was able to survive in a regime that exiled all opposition. On this man’s shoulders rest the hopes and dreams of millions of Venezuelans that wish to see their nation prosper. After a painstaking 4 hours of counting the votes, Venezuelans finally heard the official results: Nicolas Maduro (appearing on the voting ballot 14 times) beat Henrique Capriles (appearing once on the ballot) with 50.66% of the vote. Immediately following the results, Twitter and Facebook were inundated with allegations of discrepancies in the voting. Capriles screamed what everyone was thinking: FRAUD! Moreover, Capriles called Maduro the biggest loser of the electoral process. As Maduro failed to retain power he ended up dividing the nation. This was crucial because it was something that had not occurred in Venezuela since Chavez came to power. Acting quickly, Maduro proclaimed himself President of Venezuela amidst the protests occurring around Caracas. After two days of protests, seven people were reported dead and several more arrested. Venezuela stands on the brink of civil war as its population demands change. Is this Democracy at its best? 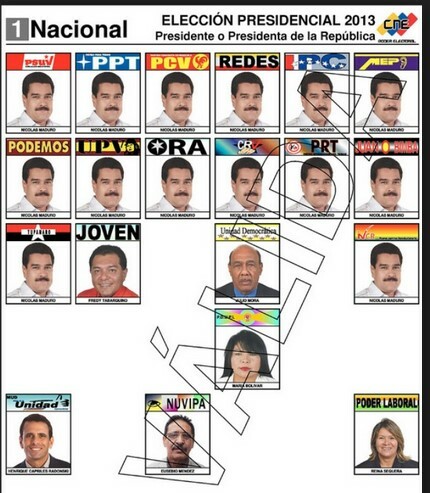 Official candidate Nicolas Maduro appears 14 times in the ballot, whereas the opposition candidate, Henrique Capriles, appears once in the bottom left corner. Here’s Why You Should Care About Venezuela? If you live in the US or Canada, then chances are that you’ve met someone from Venezuela. With over half a million Venezuelans living outside their nation, the odds are that there is a Venezuelan in your community. They can recount the painful journey of having to leave family, friends and their entire life behind because they’ve lost all hope in their country. The sad part is that the majority of these displaced Venezuelans are youths. They have had to abandon their parents and siblings because there was only enough money to send one person abroad. Sometimes, the Venezuelan immigrants are parents that have had to leave their family behind to begin building a better future in another country. Leaving behind all that you hold dear is never easy, but it’s even more difficult when escape is a matter of survival. For those lacking in empathy here is another reason: under Chavez’s rule, the Venezuelan government has been directly tied to drug trafficking. The porous and ill-secured border between Colombia and Venezuela has allowed drug cartels to move operations to the latter. According to the article “Cocaine is Unchecked in Venezuela” by the New York Times, as much as 24% of the cocaine coming from South America goes through Venezuela. 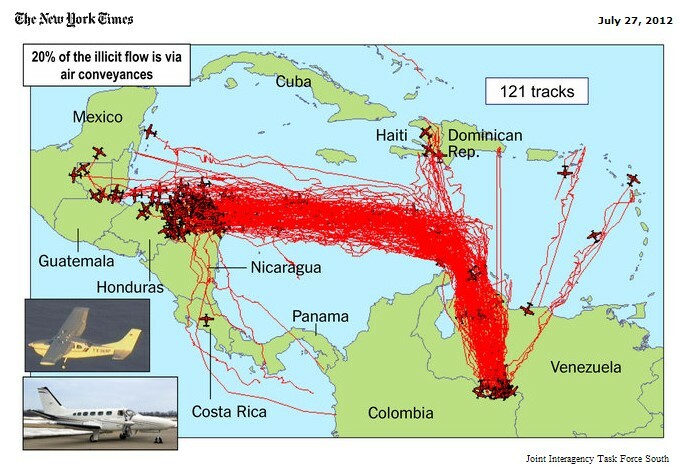 In fact, as of 2010 about 200 tons of cocaine was being exported from Venezuela to the United States. Why is that important? Drug trafficking not only devastates the consumer, but it also spreads violence and corruption along the entire drug route. Drug consumption affects not only Venezuela but the entire Latin America region; increasing violence, poverty and inequality in all these nations. If you still think this doesn’t concern you, then consider that Chavez’s Venezuela had been funding extremist groups in Iran. Venezuela is not culpable in any way for exporting oil to Iran. That’s just business. Instead, Venezuela’s real contribution to the destabilization of the Middle East comes in the form of money laundering for extremist groups through the state owned oil company PDVSA. The most recent incident of this occurred this year in Germany, where the ex-finance minister of Iran, Tahmasb Mazaheri, was arrested for money laundering with a cheque valued at US$73 million from the Venezuelan Central Bank. Now do you see why you should care about what’s going on in Venezuela? If Chavez’s regime is allowed to subsist through his cronies and nepotism, then the culture of violence and hate will continue to spread through Latin America and other world regions. It already has affected me and my beloved nation of Honduras. I pray that the heightened awareness about these issues in Venezuela bring about much needed change. The buck should stop here before it draws others into its downward spiral towards personal and international calamity.